CHICAGO — A former federal prosecutor and a county board leader will face each other in a runoff to become Chicago’s first black female mayor after leading a large field Tuesday that included a member of the Daley family that has dominated the city’s politics for much of the last six decades. 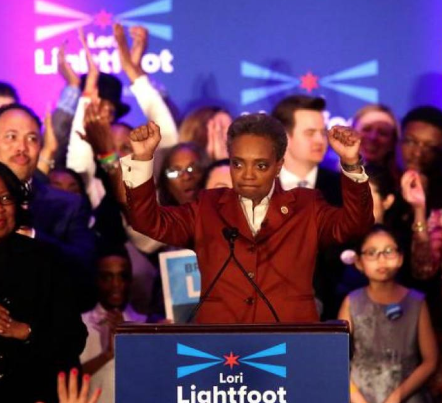 Political outsider Lori Lightfoot, who was a federal prosecutor in northern Illinois, and Cook County Board President Toni Preckwinkle were the top two vote-getters among 14 candidates, but neither received more than the 50 percent needed to avoid an April 2 runoff. The winner will succeed Mayor Rahm Emanuel to lead the nation’s third-largest city. Emanuel did not seek re-election. Among those they defeated was William Daley, who has never held major elected office but featured the most famous surname in the race. His father, Richard J. Daley, and brother, Richard M. Daley, held the city’s top job for nearly 43 years of a 55-year span before Emanuel took the oath in 2011. Daley is a former U.S. Commerce secretary who, like Emanuel, served as White House chief of staff to President Barack Obama. Emanuel ‘s decision not to seek a third term drew some of the biggest names in state and municipal government as would-be successors, along with some political newcomers with strong support, in a transitional election for a lakefront metropolis still struggling to shed its reputation for corruption, police brutality and street violence. Preckwinkle, who leads the county’s Democratic Party, also made a campaign issue out of McDonald’s shooting. “We may not be at the finish line. But, we should acknowledge that history is being made,” Preckwinkle, who previously served 19 years on the City Council and was a Chicago Public Schools teacher, told her supporters. Turnout was low Tuesday. Jim Allen, spokesman for the Chicago Board of Election, said by late afternoon turnout was around 27 percent of registered voters. The record low for a February mayoral election was 33.8 percent in 2007, when Emanuel was first elected. “It appears that some voters either just disengaged or are not willing to make a decision until they know who’s in the runoff, assuming there is a runoff,” Allen said. The variety of candidates reflected the many issues facing Chicago’s next mayor: poor neighborhoods in need of investment, overwhelming pension debt, low-performing public schools and a crime rate that is often pointed to as among the nation’s worst. However, an issue that took center stage in the contest is the need to change how business is conducted at City Hall. For some that means an end to pay-to-play, paying off influential politicians in order to do business in the city. Last month, Edward Burke, a 50-year veteran and former chairman of the City Council’s Finance Committee, was indicted after authorities said a wiretap on his cellphone captured him pressuring executives of a fast-food chain to hire his law firm in exchange for help with permits. Preckwinkle, Mendoza, attorney Gery Chico and Daley all sought to distance their ties to Burke, who had a comfortable lead in his race for re-election on Tuesday. Reforming the city’s Police Department is a job the winning candidate can’t dodge. A consent decree approved last month by U.S. District Judge Robert Dow Jr. is aimed at tightening supervision, improving training and fixing the department’s disciplinary system. The decree is the most important consequence of the shooting of McDonald by now-former officer Jason Van Dyke. A video of the shooting sparked demonstrations and resulted in Van Dyke’s murder conviction . Illinois’ attorney general sued the city to force the court’s involvement after years of inaction by the City Council, which dealt with systemic police misconduct in recent years by approving millions of dollars in lawsuit settlements. Emanuel’s popularity plummeted after release of the McDonald shooting video and he eventually decided not to seek re-election, leading to the scramble to succeed him. The city has a tradition of having a dominating mayor and a City Council that isn’t aggressive in serving as a separate branch of government, according to Bennett, the political scientist. That has meant the performance of various city departments hasn’t received adequate scrutiny. At the conclusion of Tuesday’s election (April 2) in Chicago, the city will have its first Black woman serving as mayor. 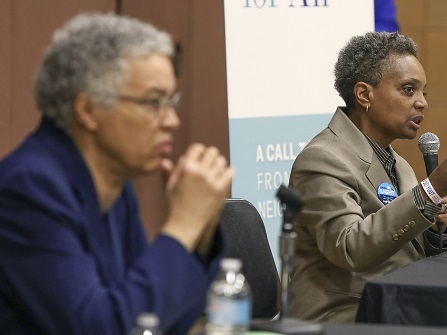 Cook County Board President Toni Preckwinkle is in a runoff against Lori Lightfoot, a lawyer who would also be Chicago’s first openly gay mayor.